Skip background, go to analysis directly, click here. After the success of PD-1 checkpoint inhibitor cancer immunotherapy, there are still plenty room for improvement. In best indications such as melanoma, only minor population responds to PD-1 therapy, less than 10% see complete response. 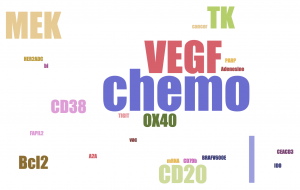 There are many cancer types, for which PD-1 does not work at all. The future lies in combination. 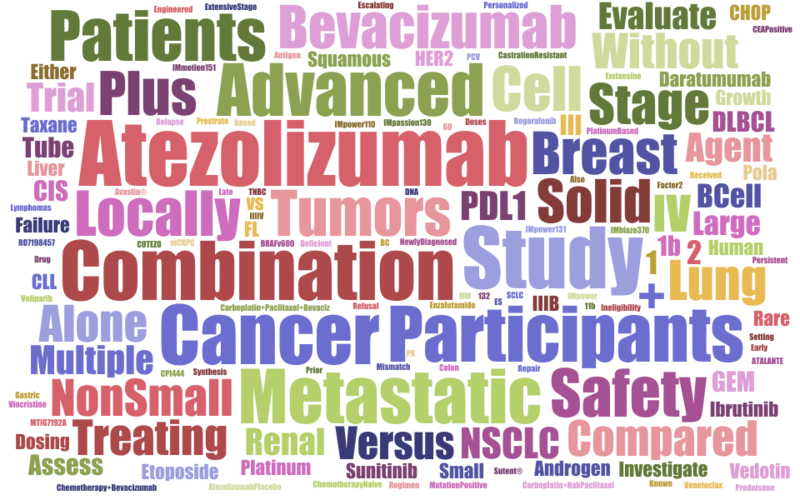 By adding other agents, stimulation, and brake inhibitors, we can further unleash the potential of immunotherapy. 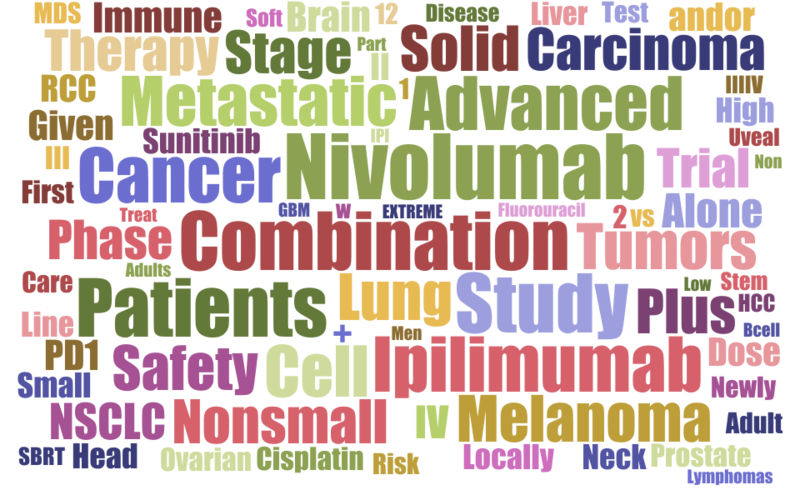 This review article summarized current road map for a combination immunotherapy. There are too many experimental cancer drugs in too many clinical trials, and not enough patients to test them on. The logjam is caused partly by companies hoping to rush profitable new cancer drugs to market, and partly by the nature of these therapies, which can be spectacularly effective but only in select patients. One in five cancer trials never finish. So whoever can gather enough resources (hospital, physician and patients) to advance trials, will win the game. Here I pulled clinical trials data from clinicaltrials.gov on Keytruda (Merck), Opdivo (BMS) and Tecentriq (Roche). 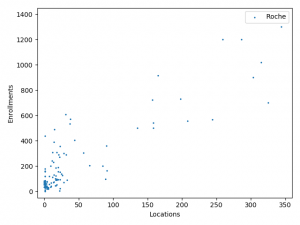 I analyzed how many locations they put on board and planned enrollments. I also analyzed keyword frequency. 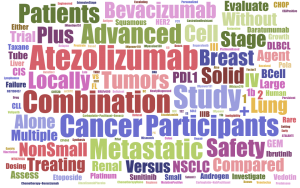 Finally, I annotated top trials to see which drug candidates and mechanisms of action get the most resources. 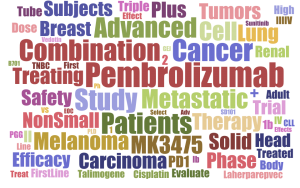 ClinicalTrials.gov: search for “combination pembrolizumab” “combination nivolumab” “combination atezolizumab”. download CSV files. I wrote Python/pandas script for analysis. Assumption: I assume companies report clinical trials to a similar extent in terms of up to date information. 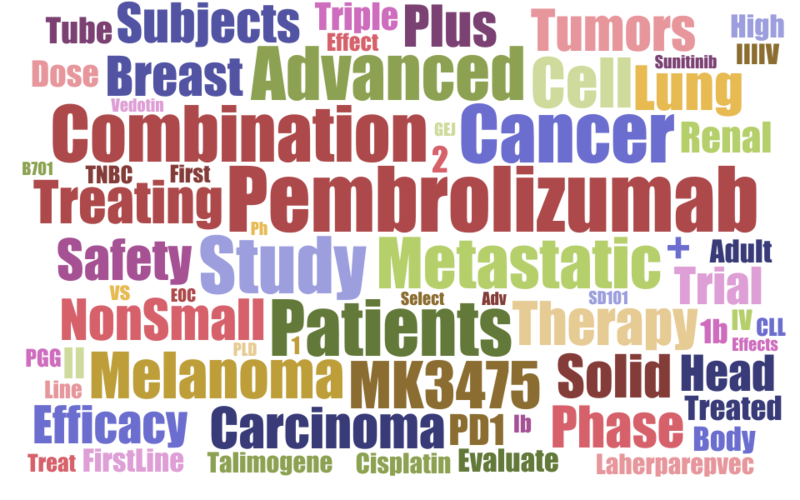 Here are the processed PD1 Combo trials data files. Resources are limited. More locations means more participating hospitals, physicians and patients. Bigger enrollment targets means bigger, longer, more convincing and costly trial. 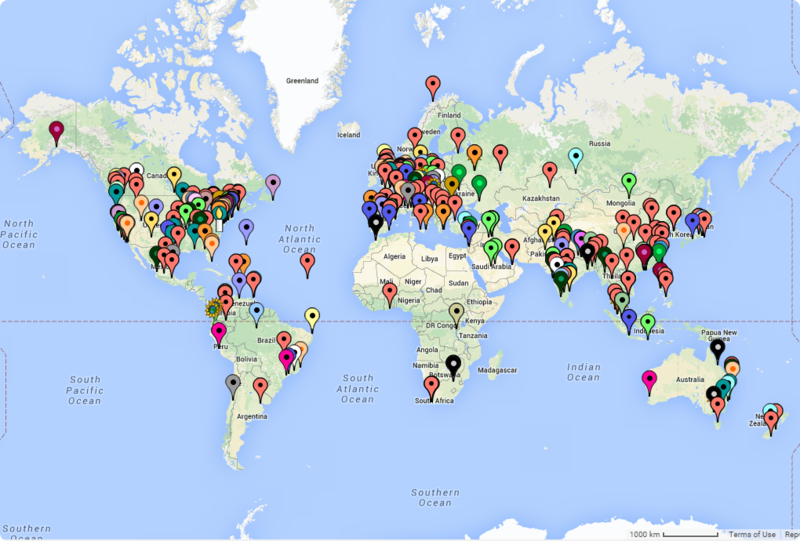 Getting more locations and enrollments show the capability of the company to attract and enlist resources. Yet, on the other hand, limited resources (money, time, talents and patients etc.) should be used well onto the most promising trials. First, I plotted total trial number, number of trials with more than 10, 50 locations. Merck has the highest number of 365 trials; while late comer Roche only has 117 trials; BMS is close to Merck. 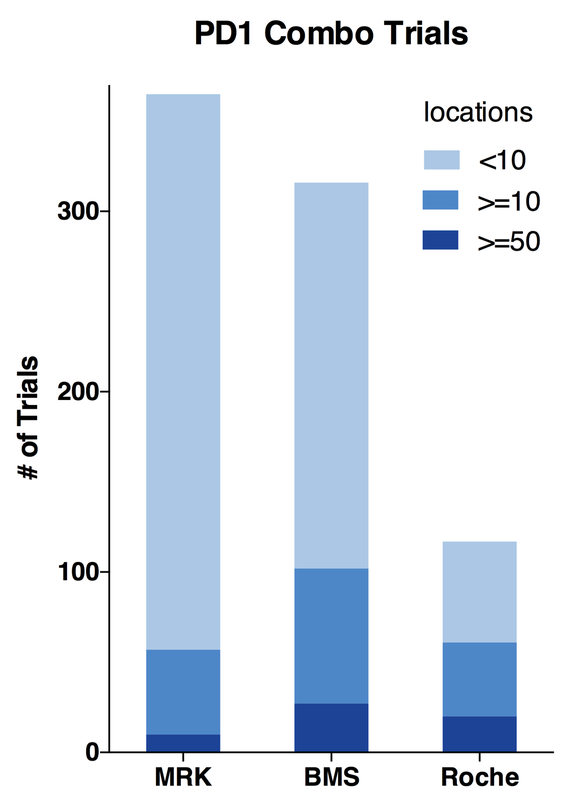 Roche is proportionally running mostly bigger trials. Its 50+ location trials are almost as many as BMS; Half of its trials has more than 10 locations. 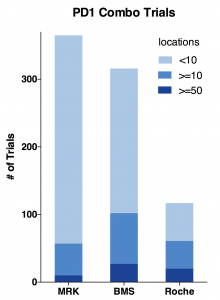 Merck is running less bigger trials and a whole lot more <10 location smaller trials. BMS is a hybrid of Merck and Roche. It has the most bigger trials by number and still doing many smaller trials. Indeed, as the charts above show, BMS has the most total locations and target enrollments. MRK has only half the total locations and about two-thirds for target enrollments. While Roche has almost same amount of locations as BMS, its total enrollment goal is only half of BMS. Considering it has only one-third of total trial number, Roche is able to use more locations to enroll patients faster. 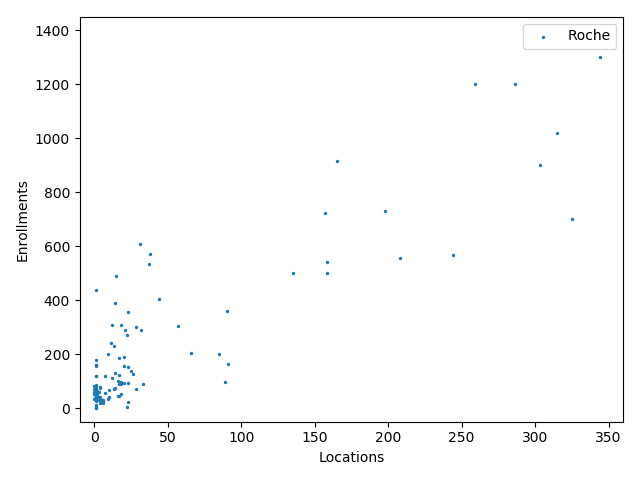 The charts above plotted location counts and enrollments for individual trial. You can get a detailed view of the conclusions we made above. Merck is more explorative. It is testing new innovative combination using lots of smaller trials before committing and spending on bigger trials. BMS and Roche are more conservative. They are testing combinations of more established anti-cancer agents. 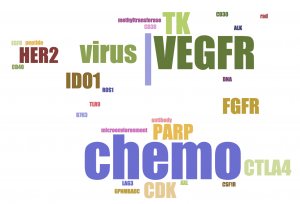 I generated these keyword clouds from all trial titles using Jason Davies’ Word Cloud Generator. It is cool that color coding for the same word is consistent across all three analyses. 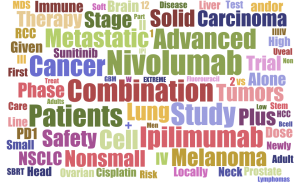 Merck is focused on Melanoma, Nonsmall Cell Lung Cancer, Breast, Renal, Head and Neck, Carcinoma and Solid Tumors. BMS is dominated by combination of Ipilimumab, anti-CTLA4. It also highlights more cancer types: MDS, Brain, Liver, B cell lymphoma, Ovarian, Prostate, on top of Merck’s, except for Breast. Roche is heavily testing combination with its Avastin (Bevacizumab, anti-VEGF-A). It is trying on less cancer types: mainly Breast, NSCLC, Renal and a few hematological malignancies. It clearly avoids Melanoma and Head & Neck, which are dominated by the two leaders. All three companies have chemo therapy in their combinations. Chemo-induced cancer cell death could release neo-antigens to antigen presenting cells (APC), initiate and boost adaptive immune response. Merck and BMS are testing more diverse (still different) classes of MOAs in their top trials than Roche. 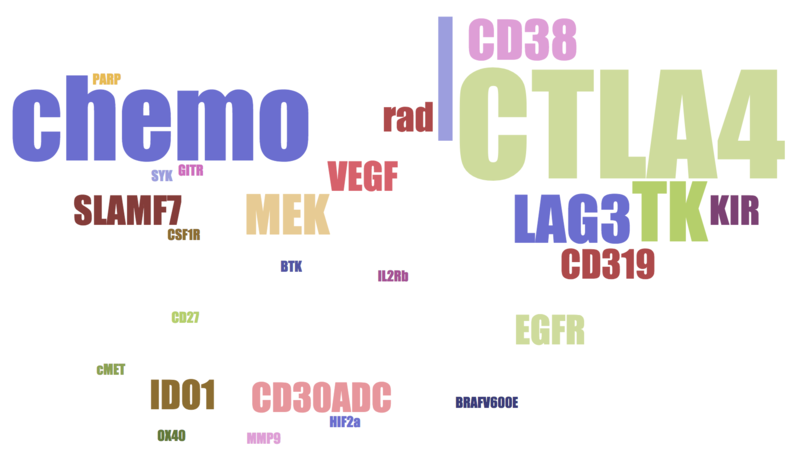 BMS is dominated by CTLA4 combinations. Merck and Roche likes VEGF. Merck likes oncolytic virus, CDK and FGFR. BMS likes CD38 and LAG3. 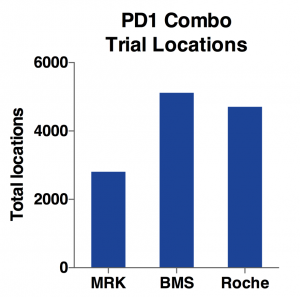 Roche likes MEK and CD20. While these word clouds highlight currently favored MOAs, it is very likely new MOAs such as TLR9 or HIF2a may emerge in the future. 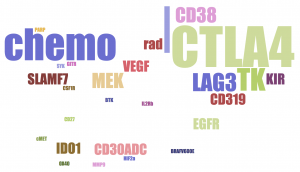 BMS is deeply invested in CTLA4 combinations, since they own it. It may turn out that CTLA4, as a redundant MOA, could only slightly boost the efficacy. Merck, running more smaller explorative trials and not burdened by CTLA4, has a better chance finding the optimal combination. 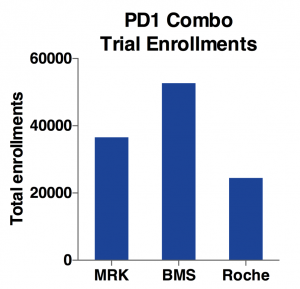 Then, BMS will lose the PD1 war badly to Merck. Roche, as a later comer, seems to play a different, more conservative strategy than the other two. The giant is waiting. Let’s see who will win this race. Wish true benefit comes to patients soon!